The moon has an internal structure similar to Earth's with crust, mantle and core. NASA deployed the frist seismographs on the moon as part of the Apollo Mission in 1969. These seismographs collected data and enabled researchers to determine that the moon's structure consisted of a thin crust of about 65 kilometers, a mantle about 100 kilometers thick and a core with a radius of about 500 kilometers. At that time seismic data processing was not advanced enough to determine the characteristics of the core. NASA researchers have recently applied state-of-the-art seismological techniques applied to the Apollo-era data and discovered that the moon probably has a core that is very similar to Earth's. An artist's rendering of the lunar core as identified in new findings by a NASA-led research team. Uncovering details about the lunar core is critical for developing accurate models of the moon's formation. The data sheds light on the evolution of a lunar dynamo -- a natural process by which our moon may have generated and maintained its own strong magnetic field. The team's findings suggest the moon possesses a solid, iron-rich inner core with a radius of nearly 150 miles and a fluid, primarily liquid-iron outer core with a radius of roughly 205 miles. Where it differs from Earth is a partially molten boundary layer around the core estimated to have a radius of nearly 300 miles. The research indicates the core contains a small percentage of light elements such as sulfur, echoing new seismology research on Earth that suggests the presence of light elements -- such as sulfur and oxygen -- in a layer around our own core. The researchers used extensive data gathered during the Apollo-era moon missions. 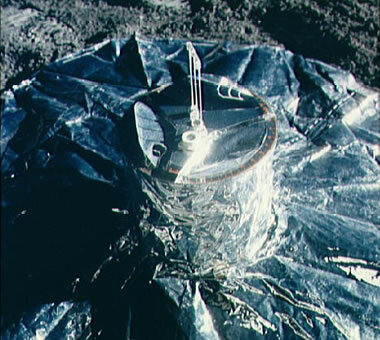 The Apollo Passive Seismic Experiment consisted of four seismometers deployed between 1969 and 1972, which recorded continuous lunar seismic activity until late-1977. "We applied tried and true methodologies from terrestrial seismology to this legacy data set to present the first-ever direct detection of the moon's core," said Renee Weber, lead researcher and space scientist at NASA's Marshall Space Flight Center in Huntsville, Ala. The team also analyzed Apollo lunar seismograms using array processing, techniques that identify and distinguish signal sources of moonquakes and other seismic activity. The researchers identified how and where seismic waves passed through or were reflected by elements of the moon's interior, signifying the composition and state of layer interfaces at varying depths. Although sophisticated satellite imaging missions to the moon made significant contributions to the study of its history and topography, the deep interior of Earth's sole natural satellite remained a subject of speculation and conjecture since the Apollo era. 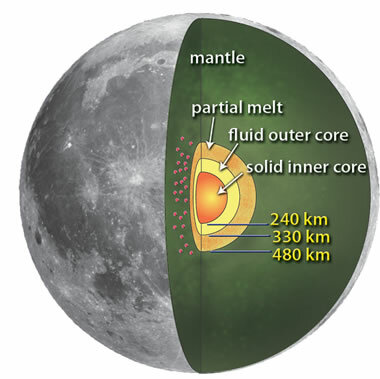 Researchers previously had inferred the existence of a core, based on indirect estimates of the moon's interior properties, but many disagreed about its radius, state and composition. A primary limitation to past lunar seismic studies was the wash of "noise" caused by overlapping signals bouncing repeatedly off structures in the moon's fractionated crust. To mitigate this challenge, Weber and the team employed an approach called seismogram stacking, or the digital partitioning of signals. Stacking improved the signal-to-noise ratio and enabled the researchers to more clearly track the path and behavior of each unique signal as it passed through the lunar interior. "We hope to continue working with the Apollo seismic data to further refine our estimates of core properties and characterize lunar signals as clearly as possible to aid in the interpretation of data returned from future missions," Weber said. A close-up view of the Passive Seismic Experiment, a component of the Apollo Lunar Surface Experiments Package (ALSEP) which was deployed on the Moon by the Apollo 14 astronauts during their first extravehicular activity (EVA-1). Future NASA missions will help gather more detailed data. The Gravity Recovery and Interior Laboratory, or GRAIL, is a NASA Discovery-class mission set to launch this year. The mission consists of twin spacecraft that will enter tandem orbits around the moon for several months to measure the gravity field in unprecedented detail. The mission also will answer longstanding questions about Earth's moon and provide scientists a better understanding of the satellite from crust to core, revealing subsurface structures and, indirectly, its thermal history. In addition to Weber, the team consisted of scientists from Marshall; Arizona State University; the University of California at Santa Cruz; and the Institut de Physique du Globe de Paris in France. Their findings are published in the online edition of the journal Science. NASA and other space agencies have been studying concepts to establish an International Lunar Network -- a robotic set of geophysical monitoring stations on the moon -- as part of efforts to coordinate international missions during the coming decade.